A nova is the sudden appearance of a bright, apparently new star, that slowly fades over several weeks or many months. All novae are associated with close binary stars. The most common novae, the so called classical novae, are associated with a pair comprising a white dwarf star and another, larger, star. The stars are sufficiently close together that matter is drawn from the larger onto the dwarf where it is heated, eventually reaching a critical temperature where a fusion reaction can take place which expels a bright envelope of material into interstellar space. Some novae are recurrent, with the process being repetitive. A type I supernova occurs in a binary star system. One of the stars, a white dwarf, accretes matter from its companion star. Eventually, the white dwarf accumulates too much matter, causing it to explode. A type II supernova occurs at the end of the life of a single, large star. As the star runs out of nuclear fuel, some of its mass flows into its core, the core becomes so heavy that it cannot withstand its own gravitational force and collapses, resulting in a giant explosion. Supernovae may be observed with relatively modest instruments. The Astronomy Section, Rochester Academy of Science, maintains a list of active supernovae. Observations of novae and supernovae by members of OASI are presented below. An LBV (Luminous Blue Variable) is a star which can exhibit sudden, massive outbursts in luminosity, mimicking a supernova - see https://en.wikipedia.org/wiki/Luminous_blue_variable. 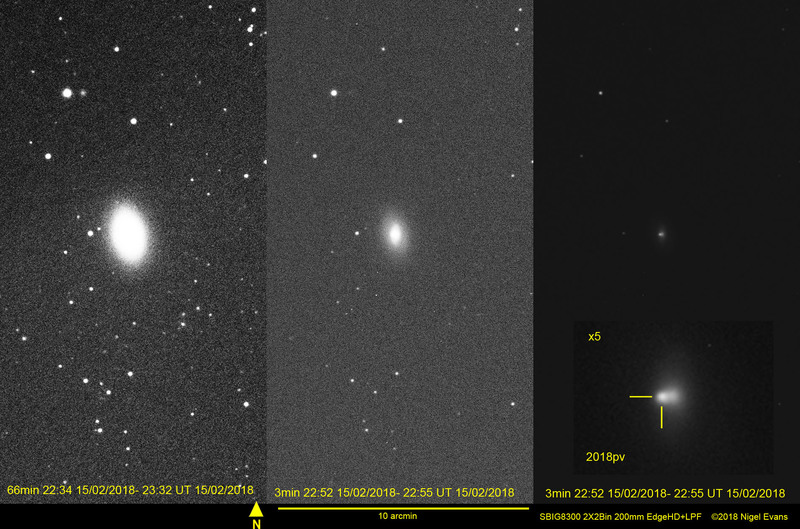 I imaged LBV 2018abn on 27 February 2019; at the time, it was around magnitude 17, so recorded well in long exposures, but could be seen in a single 3 minute sub-frame. 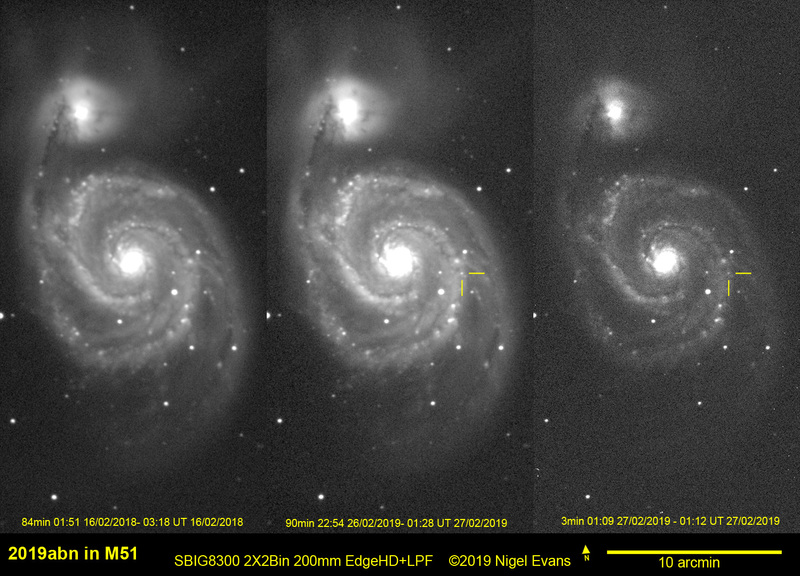 The object is in M51, so I could use my own reference image, rather than going to the Palomar DSS as is normally the case for obscure NGC/UGC galaxies. The following montage shows images captured with a Celestron EdgeHD 200 mm Schmidt-Cassegrain telescope and SBIG8300 camera. 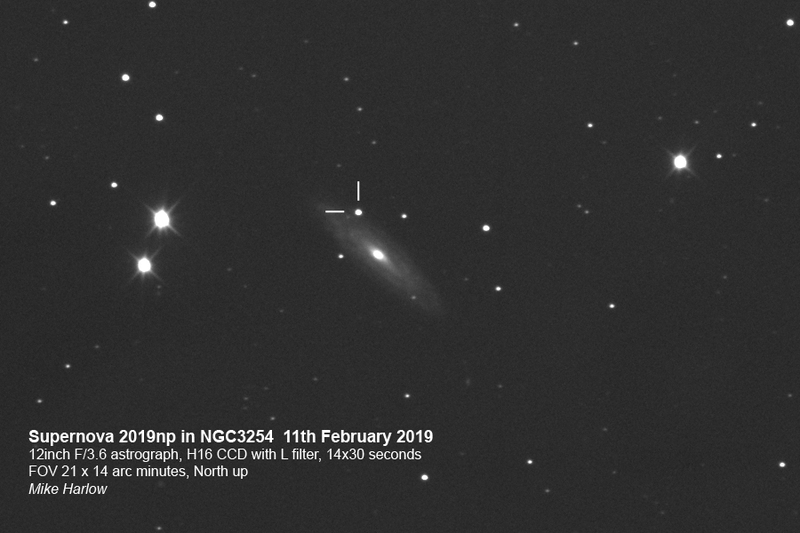 On 09 January 2019, Koichi Itagaki discovered magnitude 18 supernova 2019np in spiral galaxy NGC 3254 in the constellation Leo Minor. Image by Nigel Evans: 28 January 2019, Celestron EdgeHD 200 mm Schmidt-Cassegrain, SBIG8300 camera. 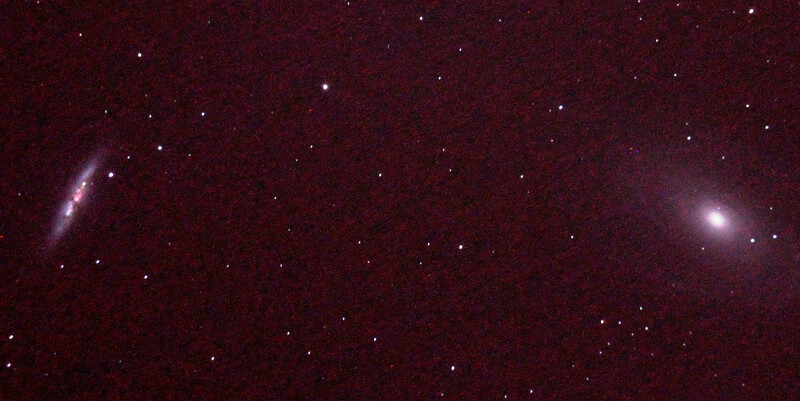 The composite below shows the former image, the corresponding image from the Palomar Sky Survey in red light, and the difference image, in which the object is clearly visible. Image by Mike Harlow: 11 February 2019, 30 cm F/3.6 astrograph, Starlight Xpress H16 camera with L filter, 14x30 second exposures. FoV 21x14 arcmin, North up. 28 January 2019, Nigel Evans. 11 February 2019, Mike Harlow. 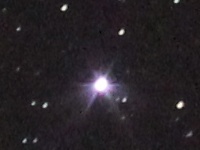 V392 Persei is a dwarf nova (similar to a classical nova, but of lower luminosity, and recurrent). Its maximum brightness is generally magnitude 14. However, on 29 April 2018, it was recorded in outburst at magnitude 6.2. 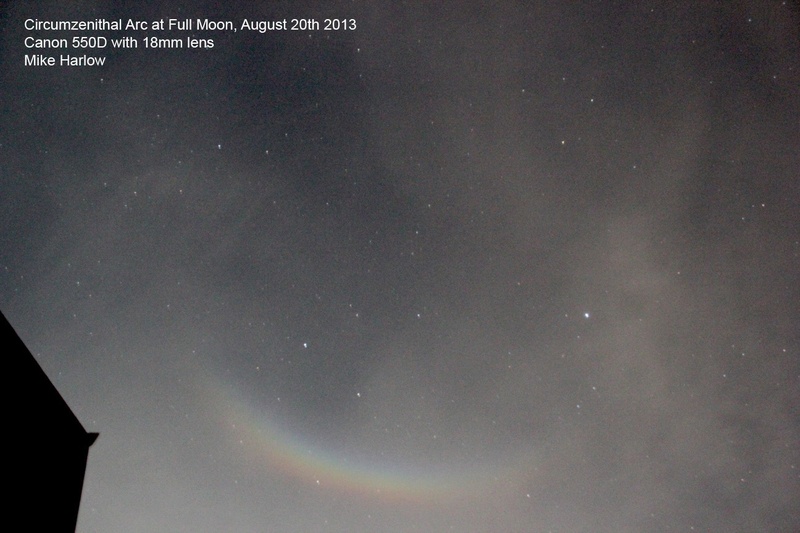 Had a bright Moon not been in the sky, the object would have been visible to the naked eye from a dark site. The object faded rapidly. 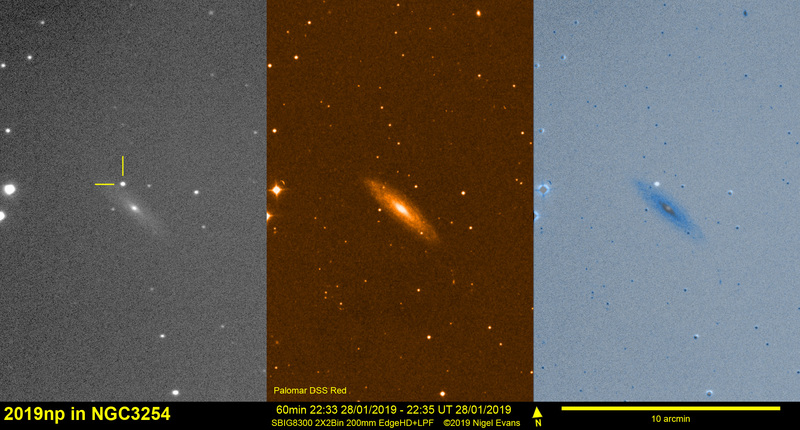 The two images below show V392 on 02 May 2018. The LH image was taken with a Canon 50D camera and William Optics Megrez 90 mm refractor; the RH image with a Canon 50D camera and 100 mm, f/4 lens. The stars labelled in the RH image are Hipparcos 21886 at magnitude 8.0 and Hipparcos 22107 at magnitude 7.3. 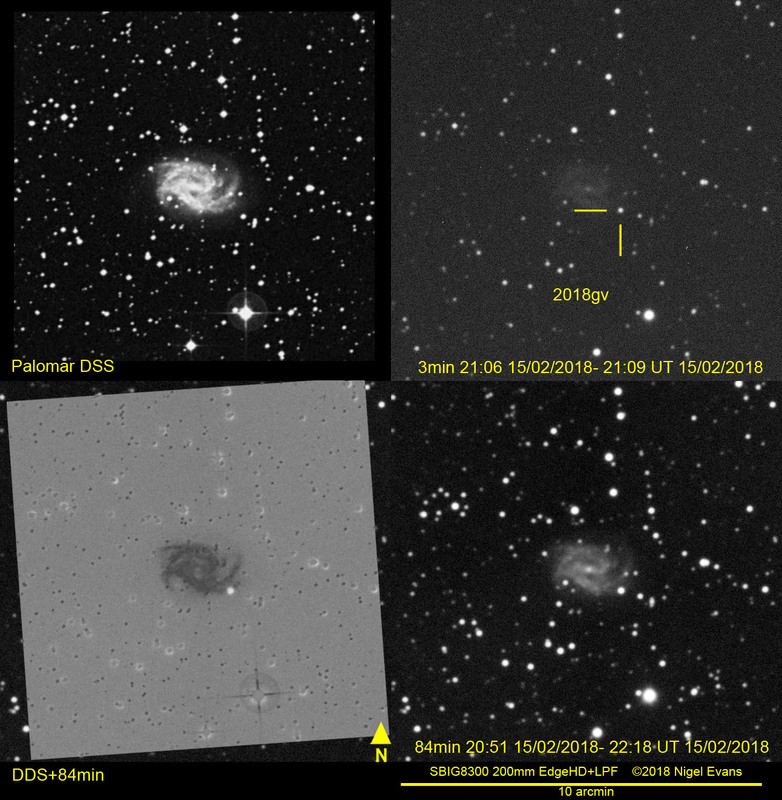 On 14 January 2018, Patrick Wiggins in Toele, Utah, discovered supernova SN 2018gj in galaxy NGC6217 (in the constellation Ursa Major.) The supernova was of magnitude 14 at the time of discovery, and so within range of relatively modest instruments. The following montage shows images captured with a Celestron EdgeHD 200 mm Schmidt-Cassegrain telescope and SBIG8300 camera, with 3 minute and 18 minute exposures. 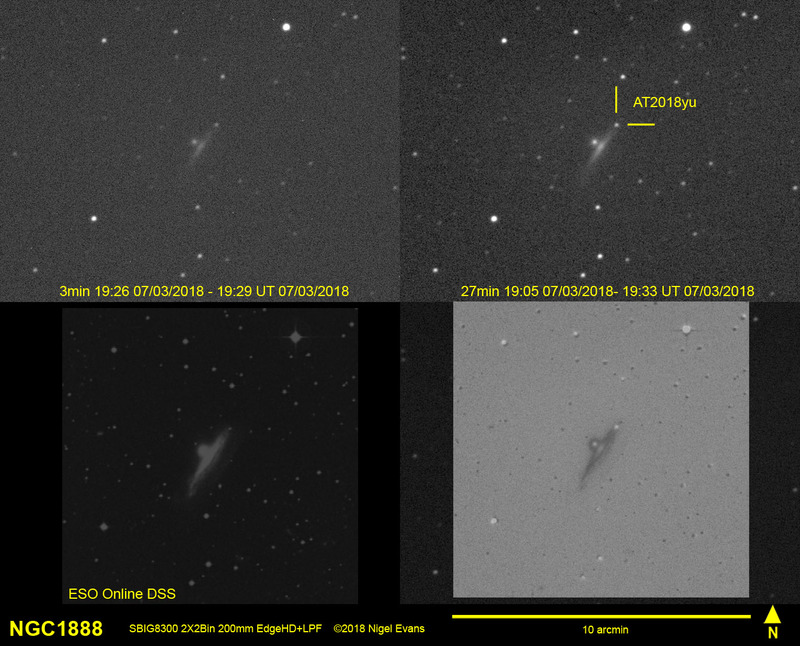 For comparison, a pre-discovery and a post-discovery image from the Sloan online DSS (Digital Sky Survey) are also shown. The following montage shows images captured with a Celestron EdgeHD 200 mm Schmidt-Cassegrain telescope and SBIG8300 camera, with 3 minute and 27 minute exposures. 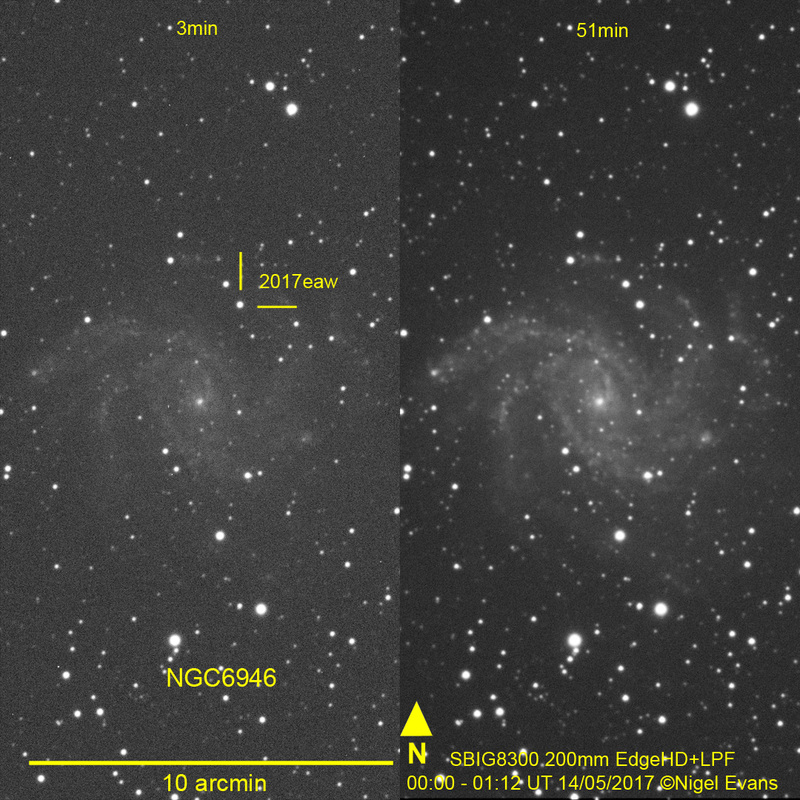 For comparison, a pre-discovery and a post-discovery image from the Sloan online DSS (Digital Sky Survey) are also shown. 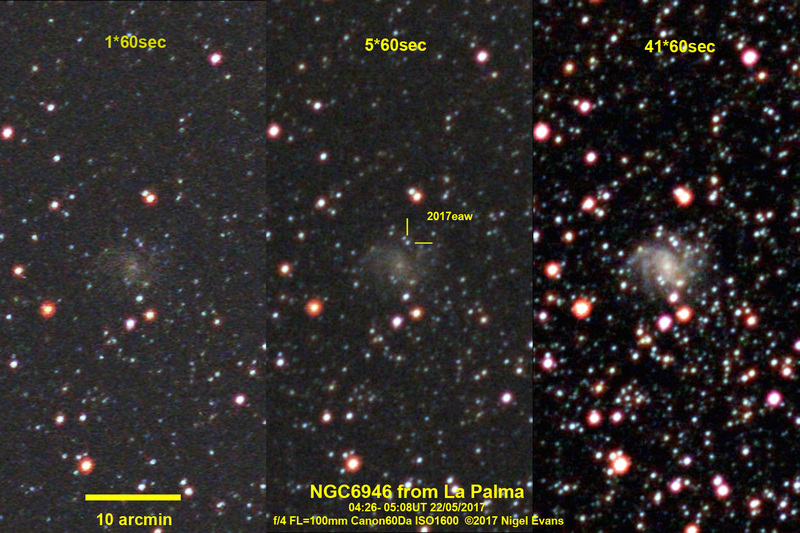 On 14 May 2017, Patrick Wiggins discovered supernova 2017eaw in galaxy NGC 6946. Its magnitude at discovery was 12.8. The supernova was the tenth to be discovered in the galaxy since the beginning of the 20th Century, causing the latter to be dubbed the Fireworks Galaxy. My first attempt to image the supernova, on the day of its discovery, was unsuccessful due to problems achieving focus. Undeterred, I tried again! The LH panel in the LH image below shows the supernova against a rather indistinct background galaxy. The image is a 3 minute exposure with a Celestron EdgeHD 200 mm Schmidt-Cassegrain telescope and SBIG8300 camera. The RH panel in the image was produced by a 51 minute exposure, bringing out the detail in the galaxy. However, a light-bucket telescope is not necessary to image the supernova. A week after the preceding image, on 22 May, I was under the dark skies of La Palma (in the Canaries). There I used a driven Canon camera with a 100 mm focal length lens set at f/4: yes, an aperture of only 25 mm! The middle image below shows the results. 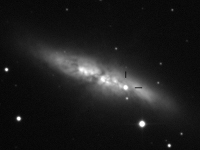 It contains three panels demonstrating that, although the image-scale is limited, the supernova is clearly visible even with an exposure of only 60 s, and that, as expected, a longer exposure produces a clearer image. Over subsequent months, the supernova faded. However, it remained within the grasp of modest equipment into 2018. The RHS image below, taken using the Celestron, contains three panels, showing the object on 26 May 2017, 17 November 2017 and 25 February 2018. Images with Celestron EdgeHD 200 mm SCT. Images from La Palma with Canon camera. 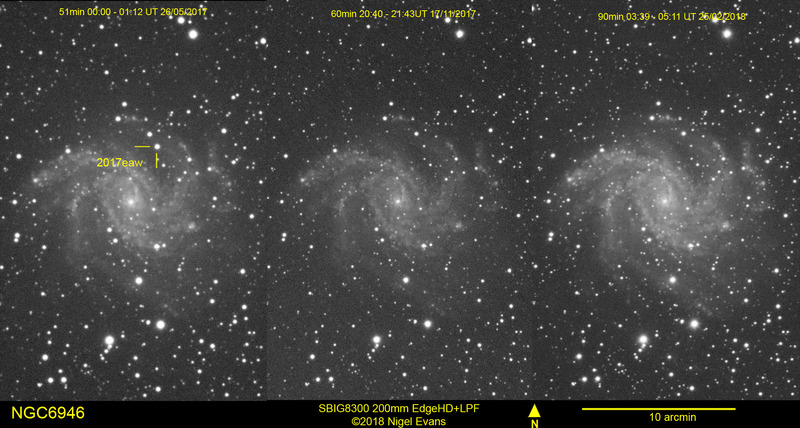 Sequence showing the supernova fading after maximum. Below are images of one of the brightest supernovae visible in February 2018. The image was captured on 15 February 2018 with a Celestron EdgeHD 200 mm Schmidt-Cassegrain telescope and SBIG8300 camera. The images of 2018gv are shown together with two professional images of the same field, for comparison. The image was captured on the same evening and with the same equipment as the image above. The broad Si II emission which is characteristic of type I supernovae. The very narrow sodium absorption (Na I D) due to gas between the Earth and the supernova, presumably in M82 itself. The core of M82 shows three emission lines: Hα, Hβ and a redder component, possibly SII (?) (@ 673 nm) from the same inner region. Note that the luminance filter has a sharp cut-off at 704 nm, which is useful for calibration. For more detailed spectra and updates, see the ARAS forum: http://www.spectro-aras.com/forum/viewtopic.php?f=5&t=766. There is also currently a spectrum on SpaceWeather.com, created with a Paton Hawksley Star Analyser, which shows similar features: http://spaceweathergallery.com/index.php?title=nova. 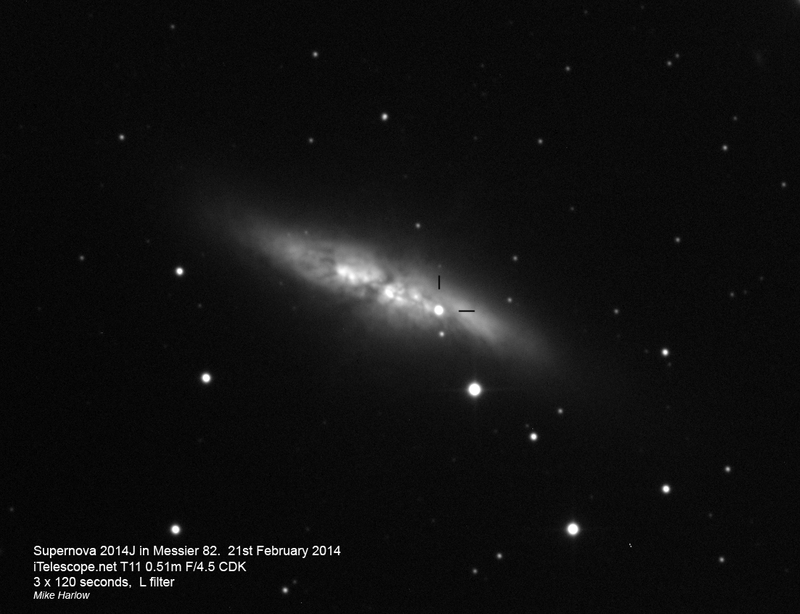 Figure 3 is an image of M82 taken by Mike on 21 February 2014 using the iTelescope.net 510 mm instrument in New Mexico. SN2014J is clearly visible. 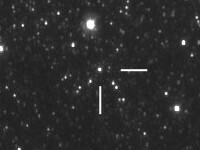 Figure 4 was taken by David Murton in February 2014 with a Skywatcher 200PDS Newtonian on HEQ5 mount and, again, clearly shows SN2014J. Figure 5 was taken on 02 February 2014 by Nigel Evans with a 200 mm, f/10 Celestron Edge HD Schmidt-Cassegrain instrument and SBIG 8300 camera using a 51 minute exposure at ISO 800. Figure 1. 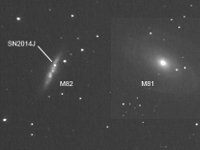 M81 and M82, the latter showing SN2014J. 110 mm, F/4.1 Newtonian. Mike Harlow. Figure 3. Spectrum of M82. 300 nm, F/4.1 astrograph with BAA objective prism. Mike Harlow. Figure 3. 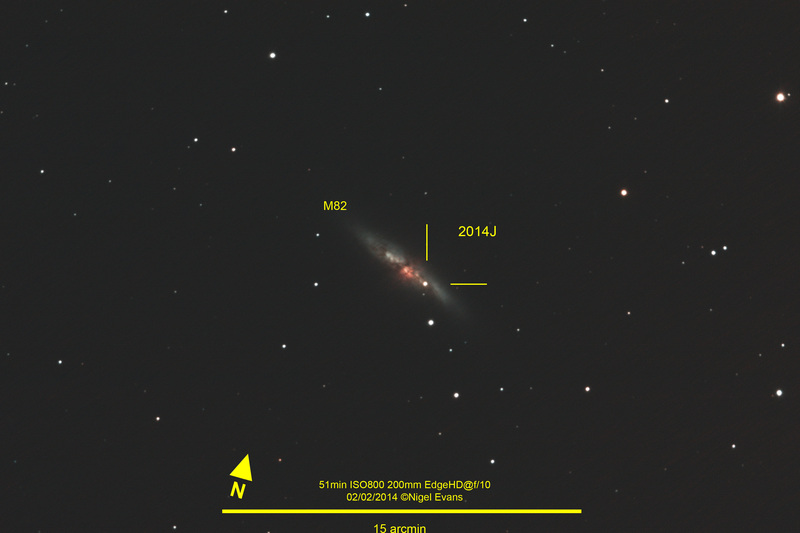 M82 and SN2014J. iTelescope.net 510 mm reflector. Mike Harlow. Figure 4. 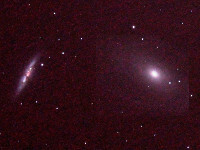 M81 and M82, the latter showing SN2014J. David Murton. Figure 5. 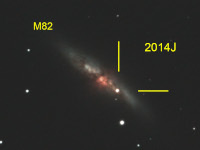 M82 showing SN2014J. 200 mm, F/10 Edge HD. Nigel Evans. On 14 August 2013, a white-dwarf star erupted in the constellation Delphinus, producing the brightest nova since 2007. 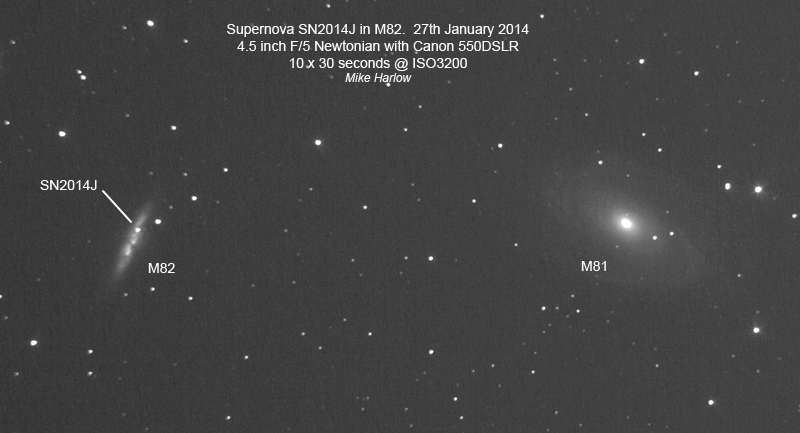 Initially shining at magnitude 4, the nova was visible to the naked eye from dark-sky locations. 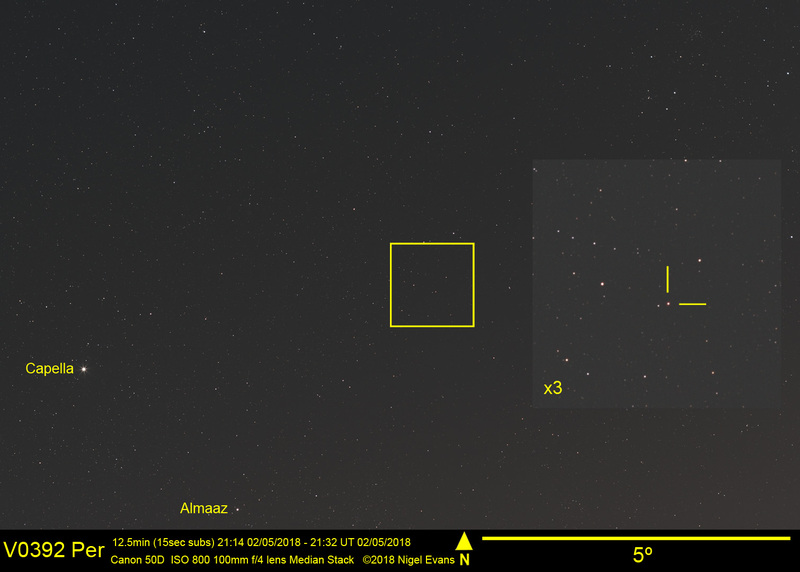 Figure 2 covers a field of view of view approximately 2.3°x1.5° and shows the nova and surrounding star field. 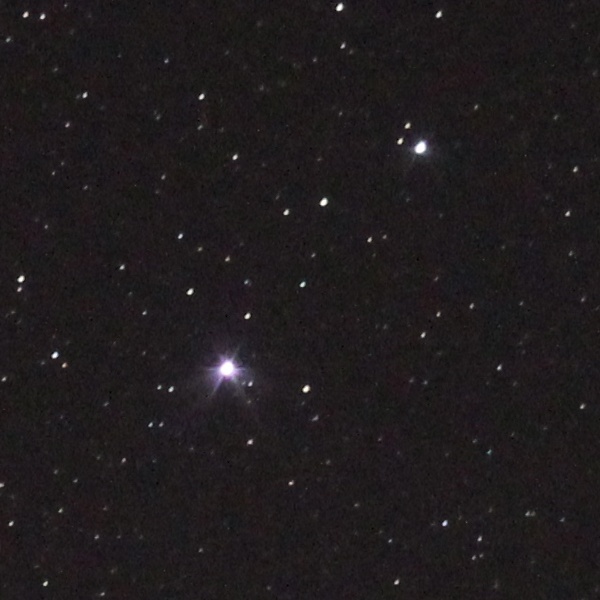 I took the image with a Canon 550D mounted on my 115 mm Newtonian; it shows stars to magnitude 13. My objective in observing the nova was to obtain a spectrum with the 210 mm aperture BAA objective prism. 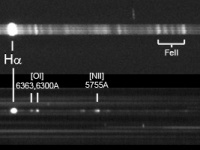 This worked well and the spectrum (figure 3) shows emission lines from the expanding gas shell of the nova with prominent Hα lines. I haven’t identified the other lines yet but some are probably due to helium. Figure 3 covers approximately the same field of view as figure 2 and shows spectra to magnitude 8. 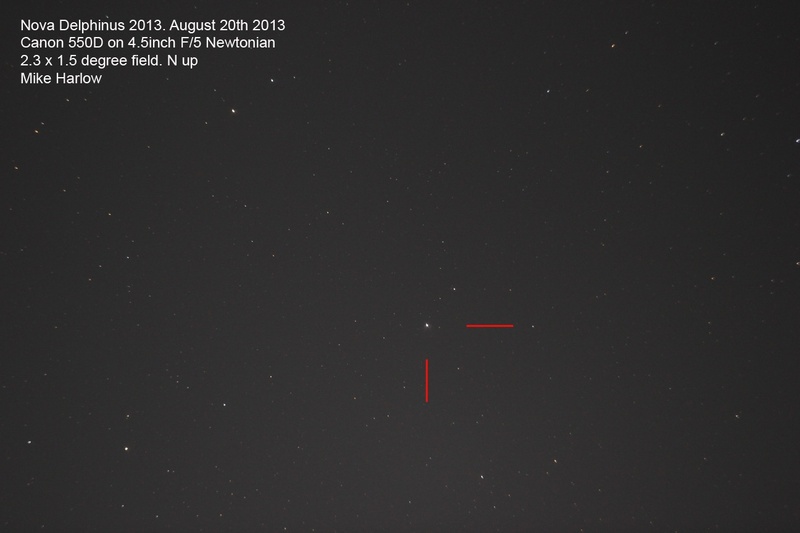 Figure 4 shows the nova on 26 August 2013. Note the white colour (see later for a change in colouration). 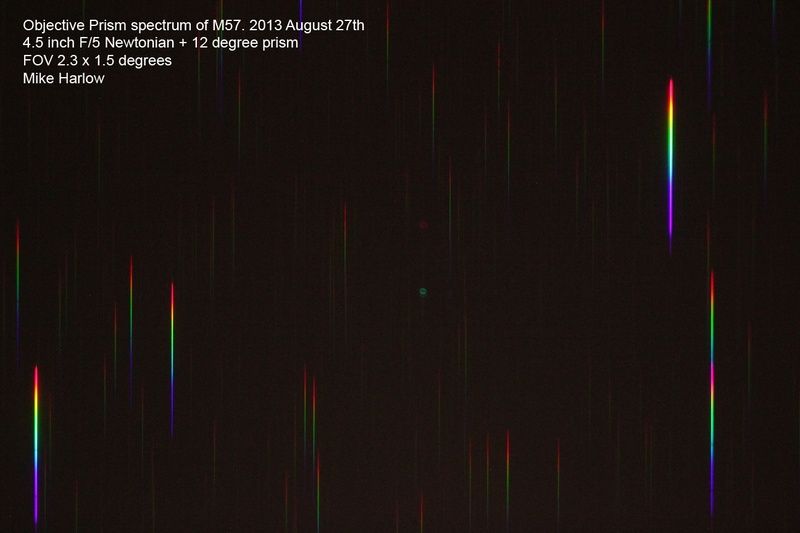 On 27 August 2013, I took the spectrum of the nova again and recorded spectra of other emission line objects for comparison (figure 5). After taking the spectrum of Vega for the standard Balmer series hydrogen lines I couldn’t resist having a look at M57: the spectrum (figure 6) shows lines of Hα and two of oxygen at 500.7 nm and 495.9 nm. 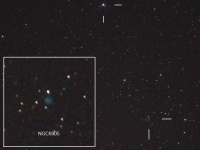 I shifted the telescope slightly south of Nova Delphini to pick up the 40 arcsec planetary nebula NGC6905 in the same field of view (figure 7). 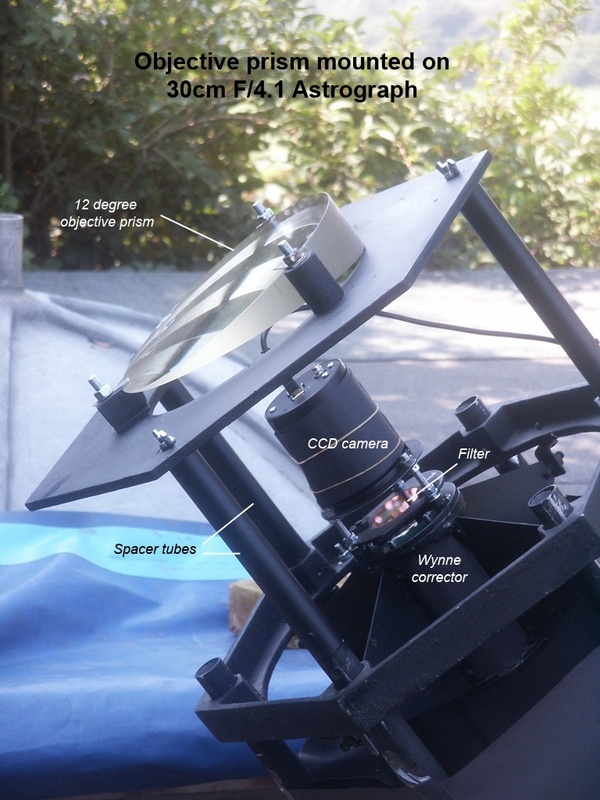 At last, on 06 September 2013, I mounted the BAA objective prism on my 300 mm f4.1 astrograph (figure 8). 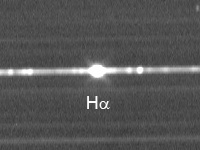 Once I had tracked down Nova Delphini, allowing for the offset of 8° caused by the deviation of the prism, I obtained a reasonable result for a first attempt (figure 9). It is a single 30 second exposure with the drive running slow to stretch the spectrum. It records spectra of stars to below magnitude 10. 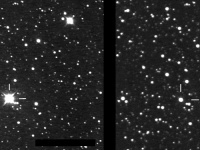 The nova shows strong emission lines from hydrogen and many lines due to iron; the latter are characteristic of lower energy novae. 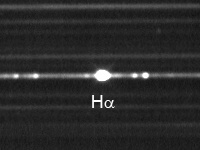 The lines appear much broader than those in the spectrum of an adjacent class F star, indicating high velocity outflow. 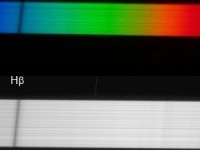 Figure 10 is a comparison of the DSLR and CCD images of the spectrum of Nova Delphini (produced by the BAA objective prism on the 300 mm astrograph). The comparison uses an Astrodon Luminance (L) filter (www.astrodon.com) which cuts off sharply below 396 nm and above 704 nm giving useful reference wavelengths for calibration. Starlight Xpress MX916 CCD, unfiltered, on 115 mm f5 Newtonian. The range of the unfiltered CCD extends well into the UV and near IR. At the UV end, the convergence of the Balmer series can be seen on the original spectra down to 364 nm. The response at the IR end should extend to near 800 nm; a lot of the structure visible at this end in the image is due to absorption in the Earth’s atmosphere from water and oxygen. To give an idea of scale the images, the full unfiltered spectrum at the prime focus of the 300 mm reflector is 16 mm long. With many lines in the spectra of Nova Delphini now identified, it should be possible to calibrate the dispersion curve for the prism. This will enable many more exciting projects to be undertaken! Figure 12 shows the nova on 14 September 2013. It provides approximately the same field of view as figure 4; comparison of the two reveals how the nova has changed colour in the intervening period of almost two months due to the increasing dominance of Hα emissions. 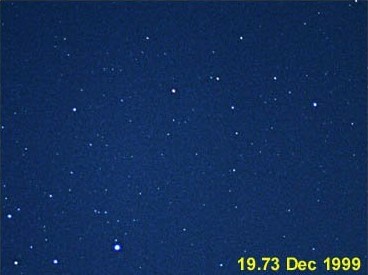 The nova is currently shining at magnitude 8. 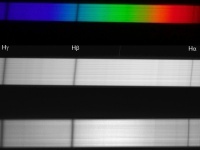 Figure 13, taken on 22 September 2013, shows the spectrum of the nova, produced by the BAA objective prism on the 300 mm astrograph, captured with an unfiltered CCD. It shows emission lines in the near-IR and absorption lines/bands from oxygen and water in Earth's atmosphere. 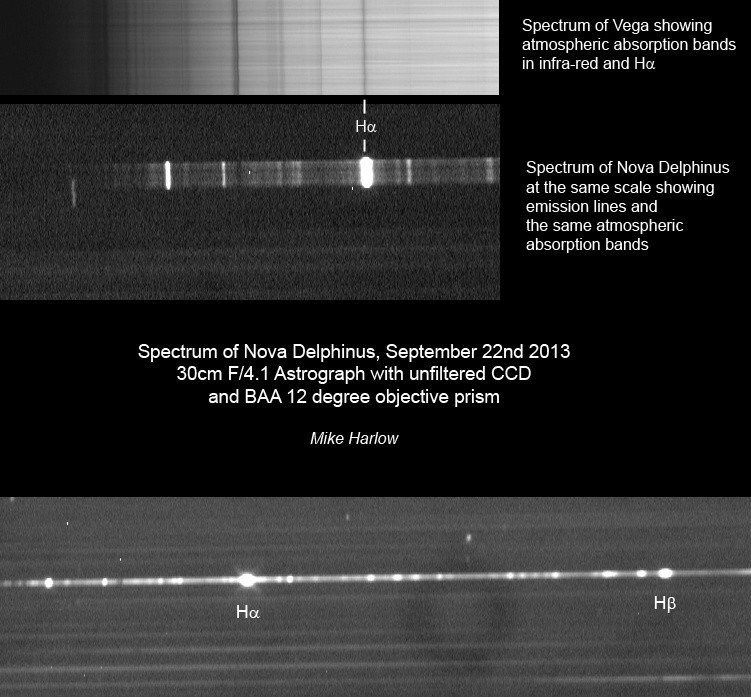 Figure 14 (again taken using the BAA objective prism on the 300 mm astrograph) shows the spectrum of the nova on 05 October 2013. At this time, the nova was continuing to fade and was below magnitude 9. 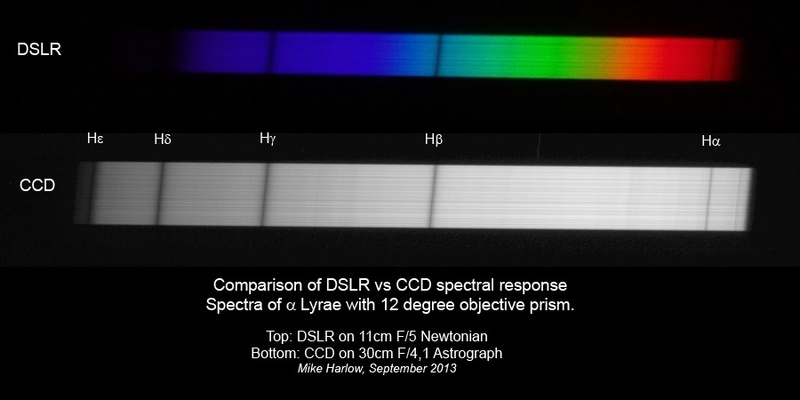 Figure 15 shows a comparison of spectra of the nova taken on 06 September and 29 October 2013 using the objective prism and a CCD. 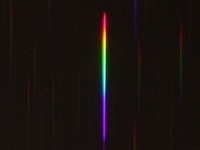 (It includes a preliminary assignment of some of the spectral lines.) By the time of the later date the nova had faded considerably and was at about magnitude 11; the later spectrum is based on a stack of 26 x 30 second exposures to give a reasonable signal. Now that exposure times are longer, more spectra of faint stars are visible and there is some overlap with the nova spectrum at the blue end. 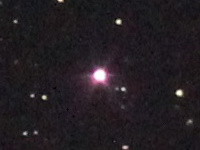 The nova is now in the "nebula" phase, showing primarily emission lines and virtually no continuum. Some advanced amateurs are using exposures of three hours to get enough signal with high resolution spectrographs! However, after an enormous amount of early activity in the amateur spectroscopy community, few results are now appearing. 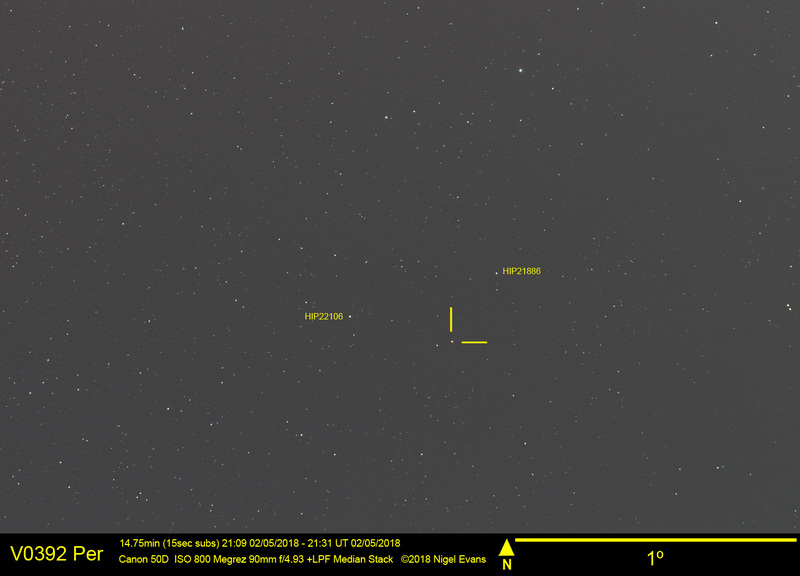 Figure 16 shows the nova fading from 02 September to 29 October 2013. The fading has currently stalled at magnitude 11 for more than a week. I aim to follow the light curve over the coming months/years until the nova returns to its quiescent state at magnitude 17-18. The light curve of the nova: www.aavso.org/lcg and search for "V339 Del". 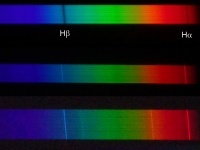 A detailed discussion of the spectrum of the nova: www.astronomerstelegram.org/?read=5546. International professional/amateur cooperation in observations of the nova: www.spectro-aras.com/forum/viewtopic. The physics of novae: www.rspec-astro.com/download/Nova-A9RCDC6.fr.en.pdf. Fig. 1. 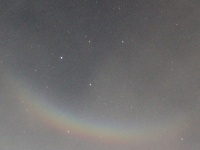 Circumzenithal arc at full moon. 20 August 2013. Fig. 2. 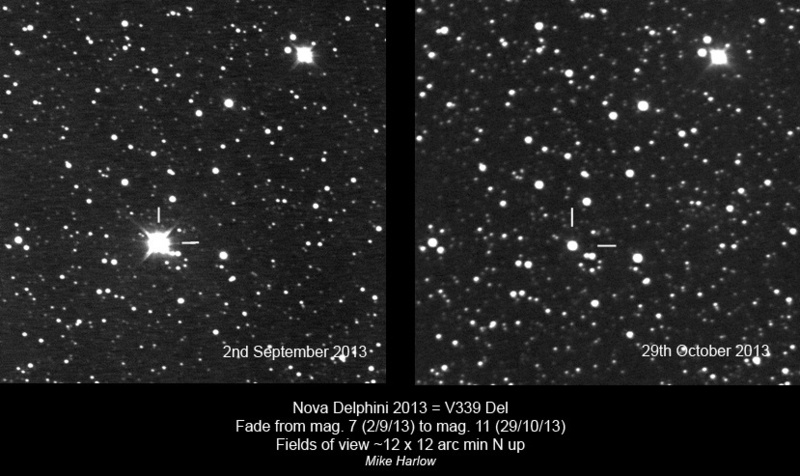 Nova Delphini and star field. Canon 550D. 20 August 2013. Fig. 3. Spectrum of Nova Delphini. 20 August 2013. Fig. 5. 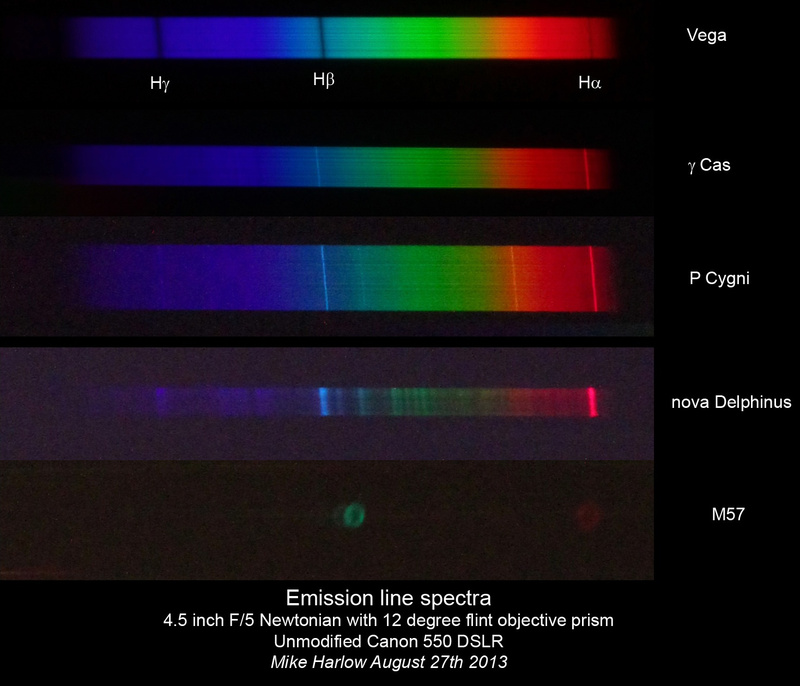 Spectra of Nova Delphini and other emission line objects. 27 August 2013. Fig. 6. 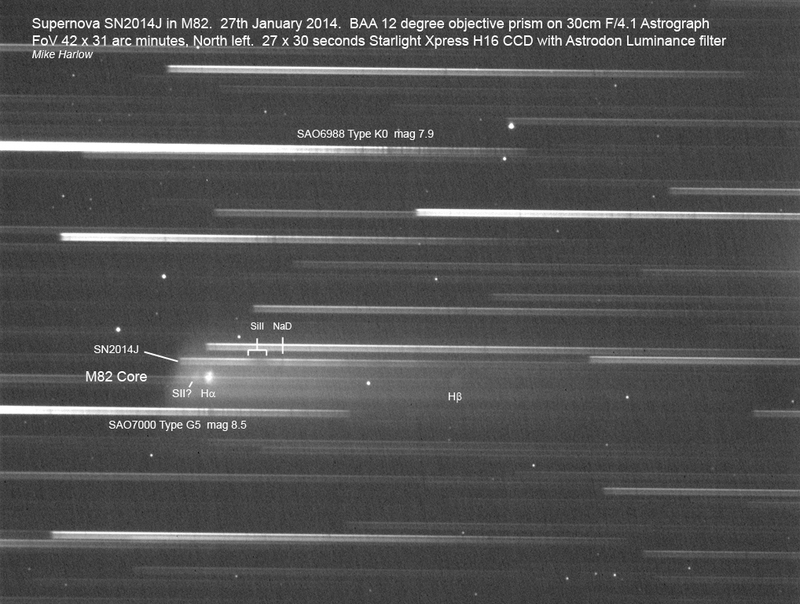 Spectrum of M57. 27 August 2013. Fig. 7. 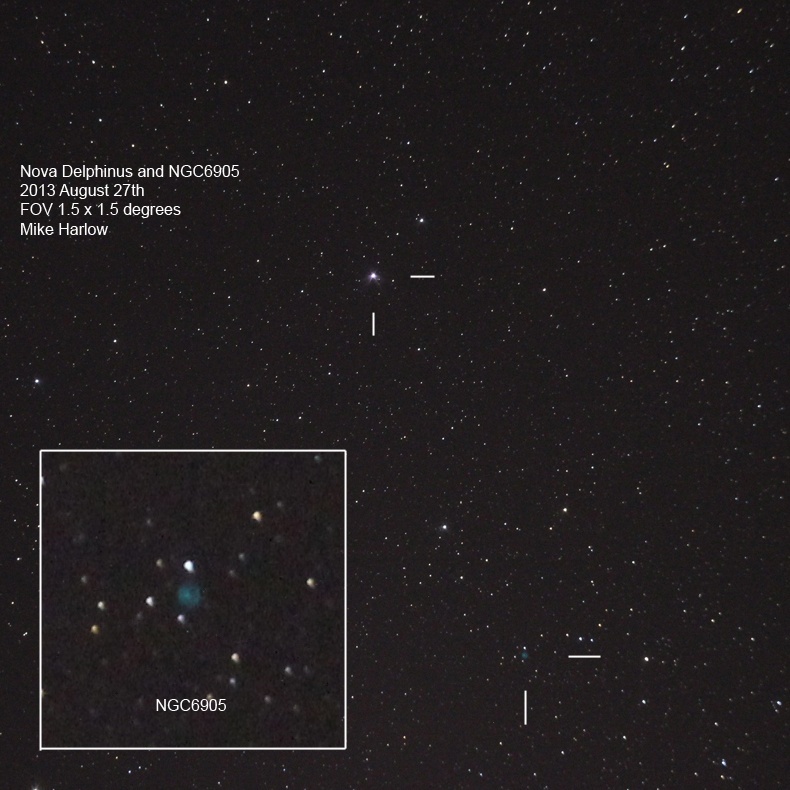 Nova Delphini and NGC6905. 27 August 2013. Fig. 8. 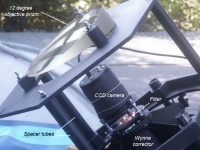 Objective prism mounted on the 300 mm astrograph. Fig. 9. Spectrum of Nova Delphini. 06 September 2013. Fig. 10. 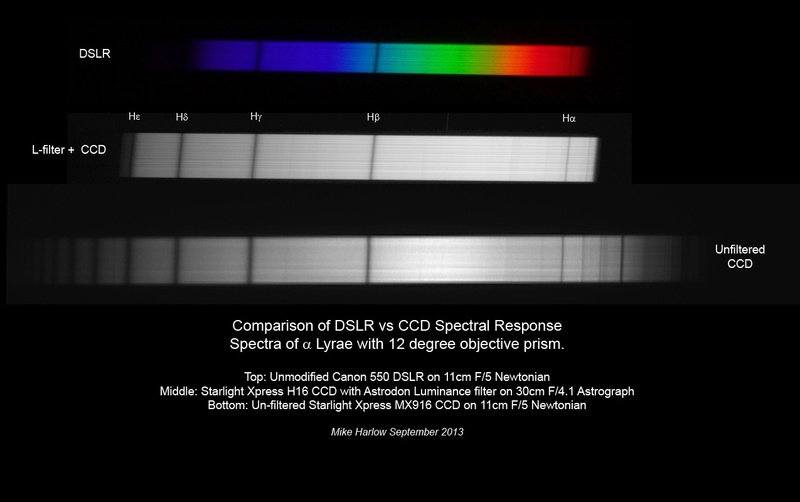 Comparison of CCD and DSLR images of spectrum. September 2013. Fig. 11. 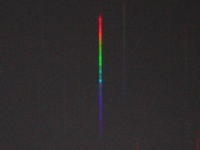 Further comparison of CCD and DSLR images of spectrum. September 2013. Fig. 12. Nova Delphini. 14 September 2013. Fig. 13. 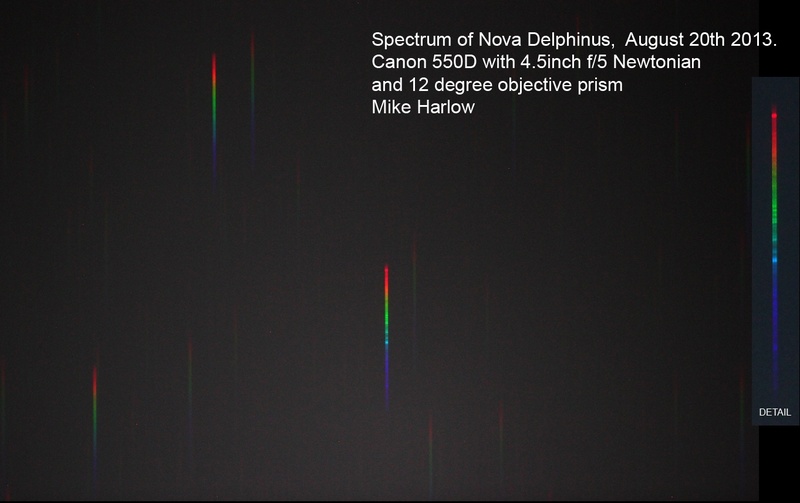 Spectrum of Nova Delphini. 22 September 2013. Fig. 14. 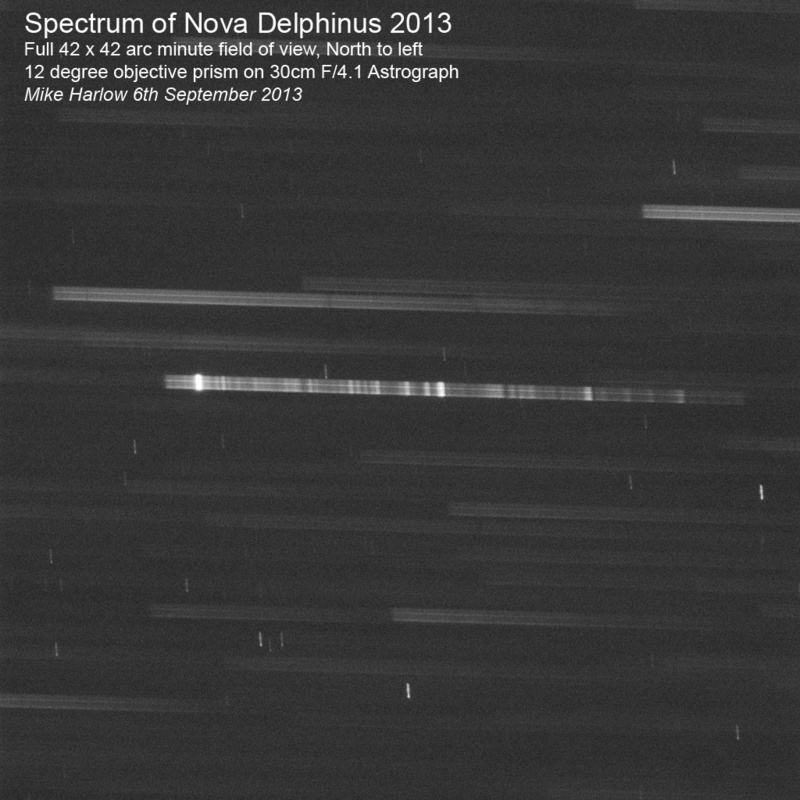 Spectrum of Nova Delphini. 05 October 2013. Fig. 15. 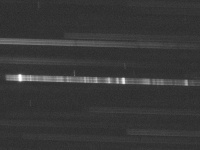 Spectra of Nova Delphini. 06 September and 29 October 2013. Fig. 16. Fade of Nova Delphini. 02 September and 29 October 2013. 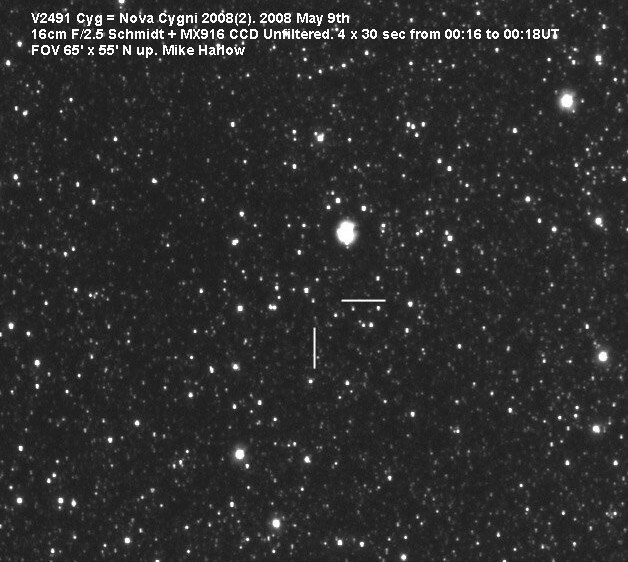 In early 2008, two novae were discovered in Cygnus, both visible through binoculars or a small telescope. The first, designated V2468 Cyg, was discovered in early March at position RA 19h 58m 34s, dec +29° 52' 12" (2000.0). The second, designated V2491, was discovered in early April at position RA 19h 43m 01.96s, dec +32° 19' 13.8" (2000.0). 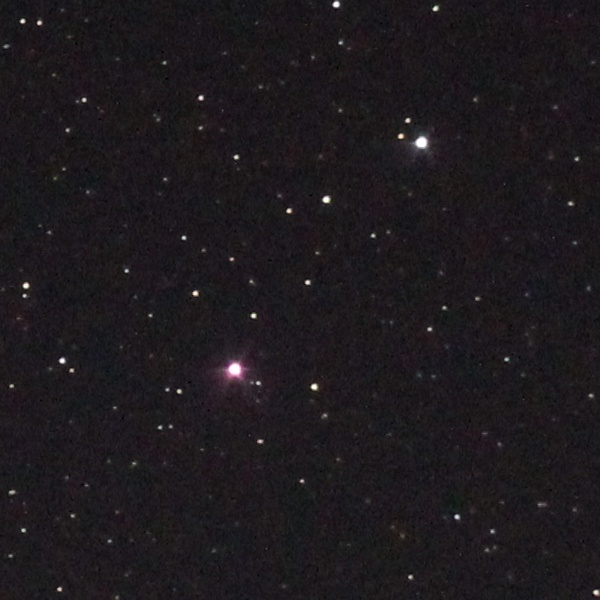 The novae were about 4° apart and both within 6° of Albireo (Beta Cygni). 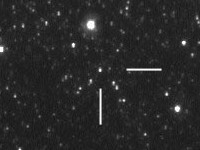 I imaged V2468 on 08 April 2008. On 11 April, I attended a BAA/AAVSO meeting in Cambridge, during which I was alerted to the existence of V2491. 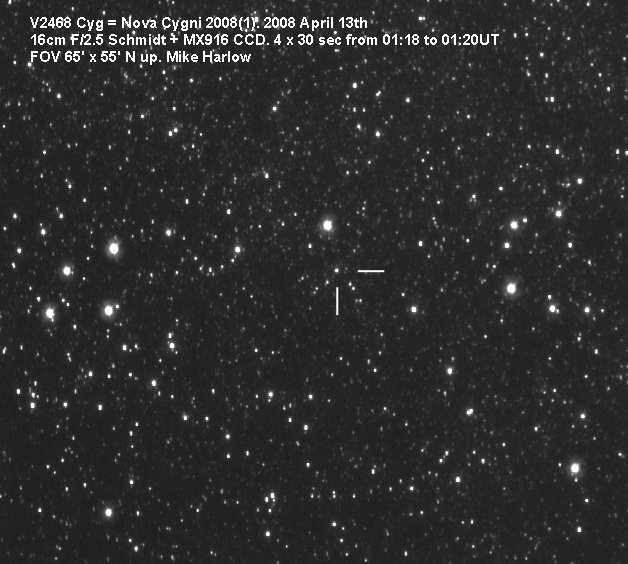 In the morning of 13 April, I imaged both novae, and was subsequently able to monitor them over the course of approximately a month. 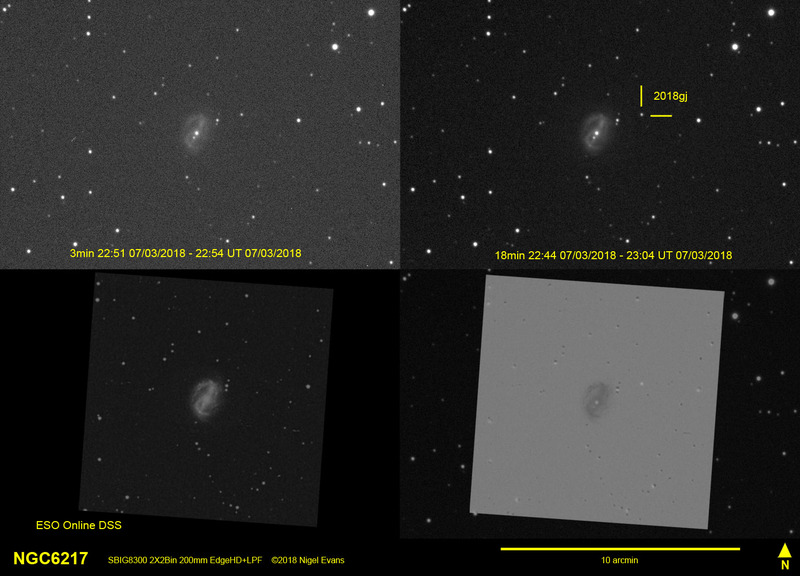 In total, I imaged V2468 five times and V2491 four times, over a slightly shorter period. The results show that the novae exhibited very different light curves (see below). V2468 faded slightly over the five days from 08 April to 13 April, then remained at more-or-less constant brightness for the rest of April, and appeared to have started fading again in early May. V2491 however had a dramatic fade early, and then faded less rapidly. 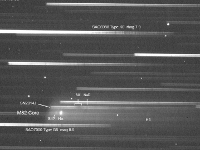 Images and light curves for these novae in The Astronomer web site. All the images were captured with my 160 mm F2.5 Schmidt and MX916 CCD camera, with four 30 second exposures. FOV 65x55 arcmin. N up. V2468, 13 April 2008, 01:18-01:20 UT. V2468, 09 May 2008, 00:05-00:07 UT. V2491, 13 April 2008, 01:39-01:41 UT. V2491, 09 May 2008, 00:16-00:18 UT. 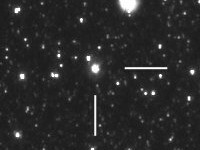 V1494 Aql was discovered by amateur nova hunter Alfredo Pereira of Cabo Da Roca, Portugal, using 14x100 binoculars on December 1.785 UT 1999. I took the images below from East Ipswich. They show how the magnitude of the nova changed in the days following its discovery. In late August 1995, two novae were visible simultaneously in Cassiopeia! They were Nova Cas 1993 (V703 Cas) and Nova Cas 1995 (V723 Cas). I imaged both objects on 29 August 1995 using a 300 mm Newtonian reflector and Starlight Express CCD camera with 40 second integration time. Nova Cas 1993 (V703 Cas). Nova Cas 1995 (V723 Cas). Details of light curves, etc are in The Astronomer website. F Garcia of Lugo, Spain discovered a supernova in the galaxy M81 (in Ursa Major) on 27 March 1993. In spring, M81 is situated near the zenith and is thus in an excellent position for observing. The star chart below (figure 1) shows the position of the galaxy: the easiest way to find it is by star-hopping from the magnitude 4.6 star 24 UMa. M81 is an almost face-on, regular spiral galaxy with a bright and condensed central nucleus. Some 38' to the north of it lies the irregular galaxy M82. Both galaxies are at a distance of about 8.5 million light years from the Earth. It is possible to fit both galaxies in the same field of view if using a low power, forming a splendid pair even in a small telescope. Figure 1. 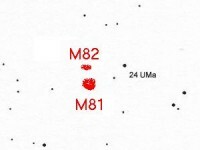 M81 finder chart. SN1993J is located approximately 5' south of the centre of the nucleus of M81. On 01 April 1993, the BAA published Circular C725, showing finder and comparison stars; it is reproduced in figure 2. For comparison, figure 3 shows a long-exposure photograph by OASI member Ric Pecce (150 minute exposure on hypersensitised Technical Pan film using 250 mm SCT at f10) taken in 1994 from Walton-on-the-Naze; it is rotated to match approximately the orientation of the BAA finder chart. SN1993J is identified by the marker lines. The magnitudes of stars marked in figure 2 are as follows: A 8.9, E 11.8, F 11.91, G 12.45, H 12.89, J 13.00, K 13.78, L 14.10, N 14.99. Figure 2. BAA finder chart. When F Garcia discovered the supernova, its magnitude was estimated to be 14. 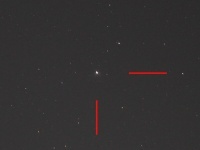 David Payne, Gary Marriott and Pete Richards made the first observation of the object from Orwell Park, using the 260 mm refractor, at 22:00 UT on 02 April 1993, estimating its magnitude at 11.8. Altogether, members of OASI obtained six magnitude estimates using the 260 mm refractor as follows. Table 1. Magnitude estimates at Orwell Park. In fact, a report by Ron Arbour in Astronomy Now showed the light curve of the supernova to be rather peculiar, exhibiting a double peak in magnitude. The supernova rose from its discovery magnitude of 14.0 on 27 March to a peak of 10.5 on 31 March, then faded to a minimum of around magnitude 12 on 05 April, after which it rose to a second peak around magnitude 10.5 in early April, before fading again. The observations at Orwell Park were rather sparse and missed the initial rapid increase in brightness and the subsequent initial minimum on 05 April. The first observation from Orwell Park took place during the initial fall in magnitude, and subsequent observations captured the second increase in magnitude and the subsequent long period of fading (with some evidence that the rate of decline occurred more rapidly in the immediate aftermath of the second peak. The following graph shows the initial portion of the "official" light curve and the estimates made at Orwell Park. The Astronomer Early Warning Circular No 35 alerted members of OASI to the discovery of a supernova about 130 arcsec SE of the nucleus of the galaxy M100 (NGC4321). The discovery was made by visually by Gus Johnson, an amateur astronomer from Maryland, on 19 April 1979, only the third supernova ever to be discovered in this way. (Usually, such objects are found by detecting changes in the brightness of objects on photographic plates, or detecting an object on a plate where there was none previously.) The International Ultra-Violet Explorer (IUE) satellite has been turned towards the supernova to record, for the first time from space, the ultra-violet spectrum of a supernova. 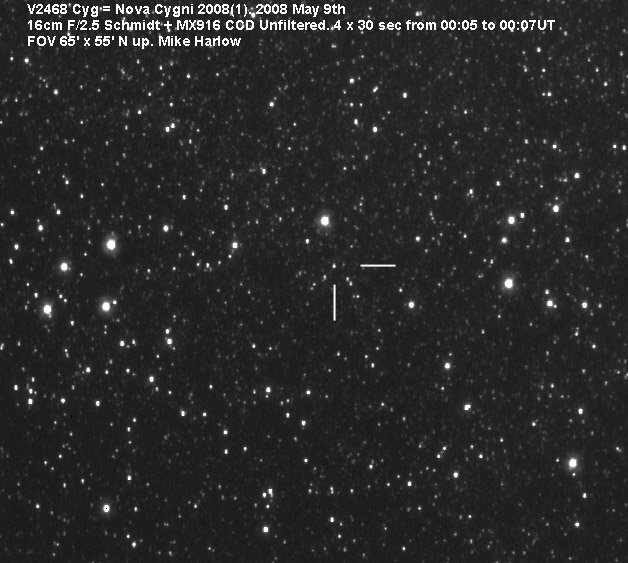 At 22:30 UT on 28 April, Mike Barriskill and I observed the supernova with the Orwell Park 260 mm refractor. 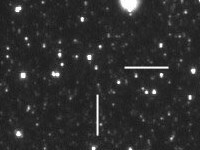 The object was clearly visible and Mike estimated it to be approximately magnitude 12 (no comparison stars had been identified at this stage). I sketched the star field below, and have appended the magnitudes of the comparison stars listed subsequently in The Astronomer Circular No 36. Due to luck with the weather and Mike's skill in using the Orwell Park refractor, by mid-May several members of OASI had seen the supernova. On 18 May, using the comparison stars suggested in Circular No 36, Mike together with other observers estimated the magnitude of the supernova as 13. 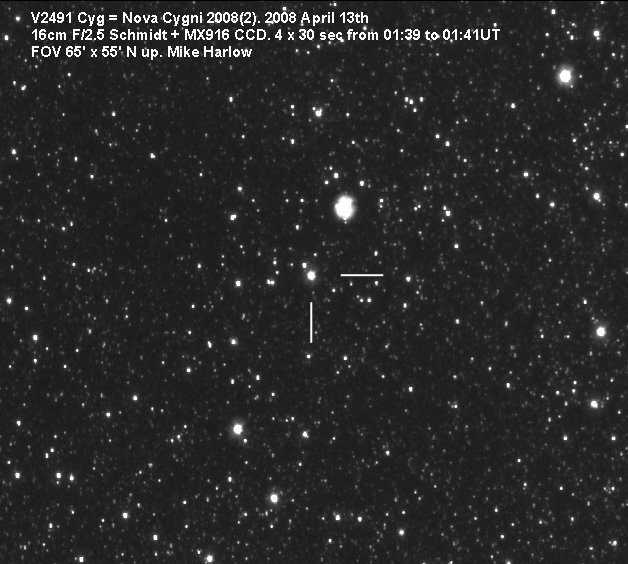 On 10 September 1978, Warren Morrison of Ontario, Canada discovered a nova in Cygnus at coordinates RA 21h 40m 23.28s, dec 43° 48' 09.9" (epoch 1950), within a degree of Nova 1876. The nova was subsequently designated Nova 1978B (V1668 Cyg). On 12 September, news of the discovery reached OASI by means of a BAA Circular. At this time, the nova was thought to be still brightening. Together with Mike Barriskill, I observed the object on three nights in September. Unfortunately, by the time of our first observation, the nova was past its peak magnitude of 6.2 and was fading. 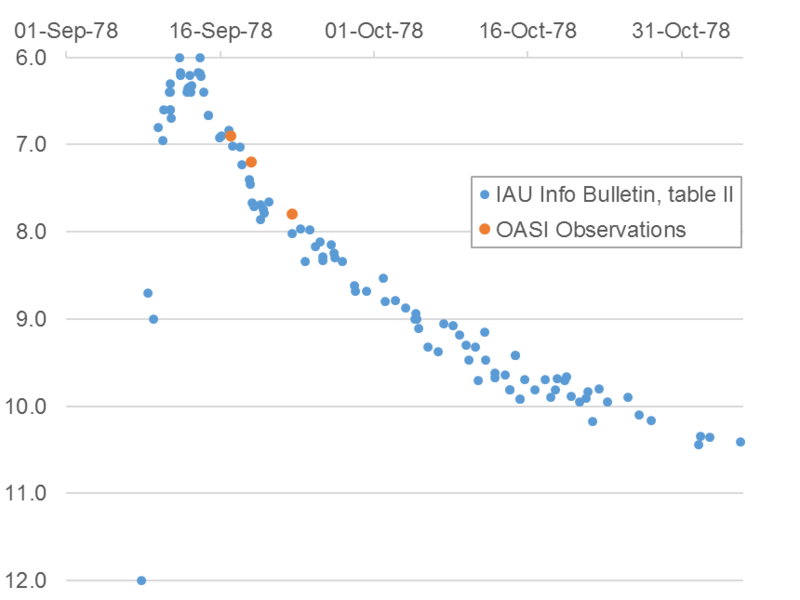 David and Mike's magnitude estimates are compared below with a consolidated light curve published in an IAU (International Astronomical Union) information bulletin (table II in ). 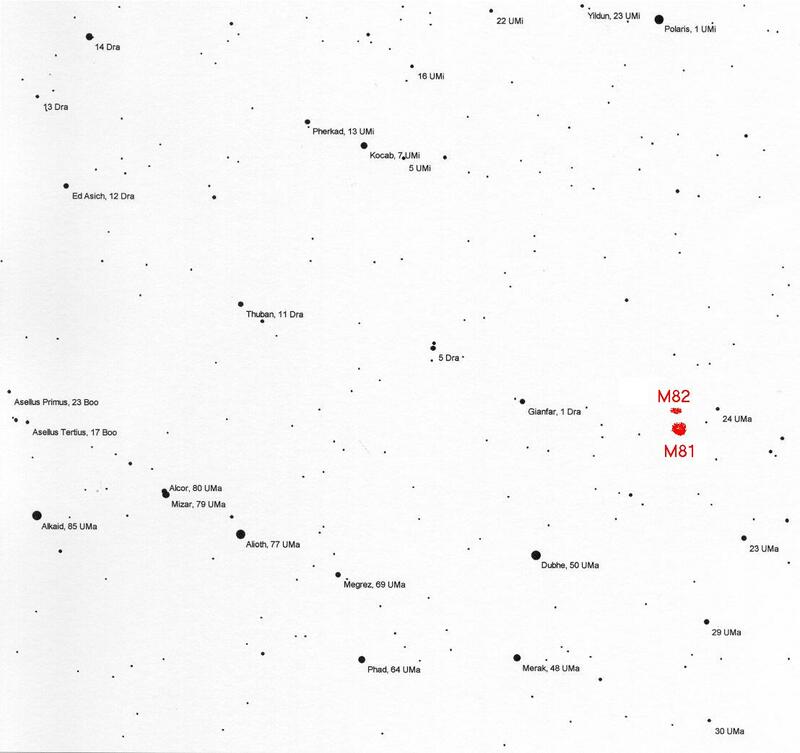 "Light Curve And Characteristic Photometric Parameters Of Nova Cygni 1978 (V 1668 Cyg)", Commission 27 of the IAU, Information Bulletin on Variable Stars, no. 1913, Konkoly Observatory, Budapest, 21 January 1981.